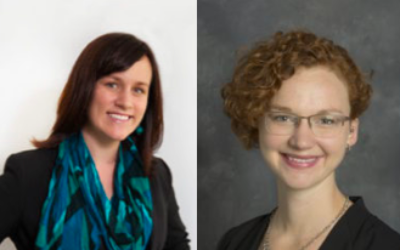 Image Source: From left to right: Dr. Breanne Grace and Dr. Rebecca Janzen. Recently, ROLC Core Faculty Dr. Breanne Grace was named one of fourteen 2019 Breakthrough Stars by the University of South Carolina’s Office of the Vice President for Research. Dr. Grace holds a PhD in Sociology from Michigan State University and is currently Assistant Professor in the College of Social Work, focusing on policy issues surrounding immigration, refugee resettlement and citizenship, and humanitarian aid. Dr. Grace’s research examines the role of rule of law development in refugee situations, with a particular focus on Tanzania. In 2018, she published a research paper, “Complex Vulnerability and Access to Justice for Former Refugee Populations: The Case of the Somali Zigula in Tanzania,” in which she analyzes “durable solutions” to the obstacles that refugee populations face during resettlement and citizenship processes, and offers recommendations to rule of law practitioners. ROLC Associate Dr. Rebecca Janzen was recently recognized in UofSC Today. Dr. Janzen’s research primarily focuses on gender, disability, and religious studies in Mexican literature and culture, specifically in the context of excluded populations throughout Mexico. Dr. Janzen holds a PhD from the University of Toronto and joined the Department of Languages, Literatures, and Cultures at USC in the Fall of 2017. She was awarded an SCOER faculty grant in 2018, allowing her to work with libraries’ experts and further her research on excluded populations across Mexico, as well as creating a cost-free course in her area of expertise.